“It is such a happiness when good people get together – and they always do”. This is one of Jane’s famous quotes, spoken by Miss Bates in Emma. I always find this quote applicable when meeting my fellow Janeites in the Netherlands. Although most of us read the books at school or just for pleasure, the fame of Jane started in the Netherlands with the broadcasting of the 1995 BBC series of Pride and Prejudice on Dutch television. This was followed by other famous productions, such as Persuasion and Emma. The appeal of Jane’s wit, the beautiful landscapes, the grand houses (and who could forget Colin Firth?) - all of it had the same effect in the Netherlands as it did in England. However, this series was not the first broadcast of Pride and Prejudice in the Netherlands. In 1961, there was a Dutch version on the television called De vier dochters Bennet (or in English, The four daughters Bennet.) For some reason, the role of Kitty was deleted. In 2009, Monique Christiaan organised the first Jane Austen dance lessons in Amsterdam and later founded the Jane Austen Society of the Netherlands. 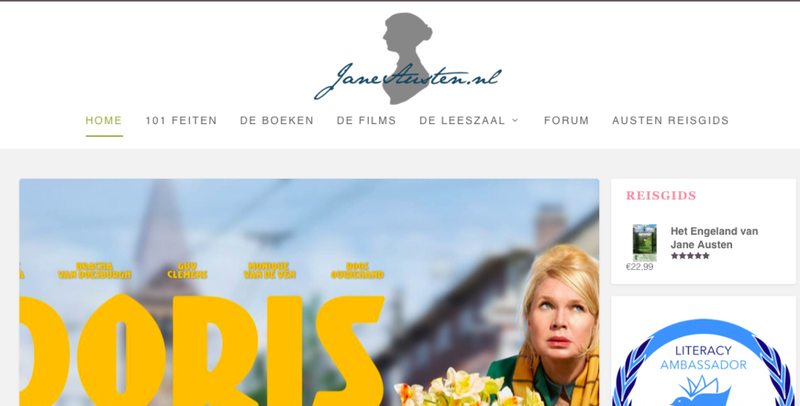 Also in 2009, and by complete coincidence, Karin Quint (a Literacy Ambassador for the Jane Austen Literacy Foundation and writer of the travel guide, Jane Austen’s England) decided she could not be the only Janeite in the Netherlands and started the website Janeausten.nl to meet more Janeites. After a few months, and a lot of interest in the website, we decided to organise a picnic in the centre of the Netherlands to meet each other. It turned out to be a great event (although at one point we were picnicking in the rain!). The next plan was to join the Jane Austen Festival in Bath the following year, and to visit the Jane Austen’s House Museum and Great House in Chawton. We had booked a tour in the Great House and when the seven of us were sitting in our historical costumes in our big car, we discovered a flat tyre. Luckily the train station was close by and so we took a train and a bus to Chawton. We attracted a lot of attention during our journey! When we arrived at the Great House, the staff were really excited because we were the first dressed-up visitors to the house. To make up for lost time, two ladies, including one in a sports car, took us to the museum. The contradiction between old and new could not be more obvious and the resulting picture is one of my favourites. Janeites from the Netherlands in Chawton! Credit: Odette Snel. Since then, we have travelled to quite a few European countries to attend balls and regency events. A lot of Jane Austen events have been organised in the Netherlands and new organisations have been founded - the Meryton Society (a re-enactment group exploring the life of the gentry in England), Stichting Reverence (a foundation who organises historical events), Austen Tales (a passionate Janeite who organises lectures), and the Wolves’ Grove Regency Dancers (another dance group in the east part of the Netherlands). It is fair to say that Jane Austen’s popularity is booming in the Netherlands. It was also quite an honour to receive Caroline Jane Knight for a lecture this year, organised by Austen Tales. Our passion for Jane Austen brought us together, but some Janeites have become great friends who share more than an interest in Jane. We also discuss non-Jane Austen books during our book (“food”) club. Literature and literacy have been so important in bringing people together! Image credit: Odette Snel and Julia B. Grantham. Newer PostHappy Birthday to the Jane Austen Literacy Foundation! Older PostIssue 44: New Collectable Bookplate - Meet The Artist!